A Polo Ground is 300 yards long by 200 yards wide although if it is boarded it need only be 160 yards wide. The goalposts, open at the top, are 8 yards apart. Duration of PlayThere are 4 chukkas in a match and each one lasts for 7 minutes of actual play. When the whistle is blown, the clock is stopped and only restarted when the umpire calls ‘Play’. At the end of the period a bell goes to signify that the 7 minutes are up, however there is a further 30 seconds of play unless the whistle is blown, the ball hits the boards, or the ball goes out of play. This extra 30 seconds does not apply to the last chukka unless the scores are equal. Should a match be drawn a ‘sudden death’ (i.e. first to score) chukka maybe played, and if still a draw at the end of that chukka, another one is played with the goalposts widened. There is an interval of 3 minutes between chukkas but 5 minutes at half time when traditionally spectators are invited to tread in the divots. Play starts with the umpire throwing in the ball between the two teams lined up in front of him. In the same way play is restarted after a goal is scored or if the ball goes out over the side boards. If the ball goes over the back line there is a hit-in by the defenders. There is no offside in polo nor is there a corner, instead a 60 yd hit from the back line is taken by the attacking side opposite where the ball went out of play. Polo is probably the only game in which the teams change ends when a goal is scored, thus equalling out any ground or weather advantage. A polo player must have a helmet, with or without a visor, knee guards, and a polo stick. The ball is hit with the side of the stick not the end of the mallet as in croquet. The stick is pliable and hits of up to 100 – 150 yards are not unknown. The ball is made of plastic and is 3.5 inches in diameter and weighs 4.5 ounces, still remarkably hard if it hits you. A player may challenge an opposing member by riding him off whether he is about to hit the ball or not. He may also hook the opponent’s stick just as they are about to hit the ball, providing it is done on the same side as the ball. In riding off, a player can prevent an opponent taking an active part, however the angle of the ‘bump’ must not be dangerous to either player or pony. 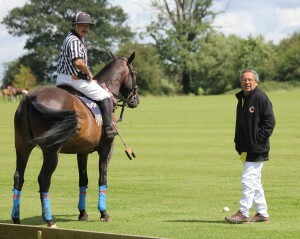 Two mounted umpires control the game. After they have blown their whistle for an infringement they often consult each other on the severity of the foul. Should they disagree they can seek the opinion of the referee or ‘third man’ as he is often known in the stands. The Right of Way, Dangerous Riding and Misuse of the Stick. The main rule in polo is that the player on the line of the ball, or the imaginary line along which the ball travels, has the right of way and may only be challenged by being ridden off, or having his stick hooked. A player riding along the line of the ball in the opposite direction may, if it is not dangerous, hit the ball provided it is the corresponding forehand or backhand as the original player. This rule can generally be compared with a dual carriageway with the central reservation being the line of the ball. There are strict rules covering the entry into that right of way and the severity of any infringement governs the severity of the penalty awarded. Penalty No 5B – A hit from the centre of the ground. This is used when the defending team are attacking from their own half.